Are you frightened of aging? Do you worry over every new physical symptom, memory lapse, or mistake? Do you keep busy to avoid thinking about being "old" or brag about how happy you are in retirement when you secretly feel pretty low? Do you believe that aging is really about waiting to lose everything that matters? For most of human history, we viewed aging like this - as inevitably grim, depressing, and hopeless. It's no wonder no one wants to talk about it. But no longer. A radically new kind of aging is on the horizon, one that can change us, the culture and the world. And millions of us are getting ready for this new adventure. The first wave of 76 million “Baby Boomers,” representing 28% of the American population, began turning 65 in 2011. Every day ten thousand more join this amazing tsunami and will live longer than any previous generation in history – at least 15 years more than their parents! – creating an entirely new stage of life. As a psychologist, interfaith minister, author and aging Boomer, I’ve been exploring the possibilities of this revolutionary "Third Age" for several years and what I have learned is breathtaking. I now believe that twenty-first century aging represents a new and largely uncharted stage of psychological and spiritual development. And I am not alone in this optimism. 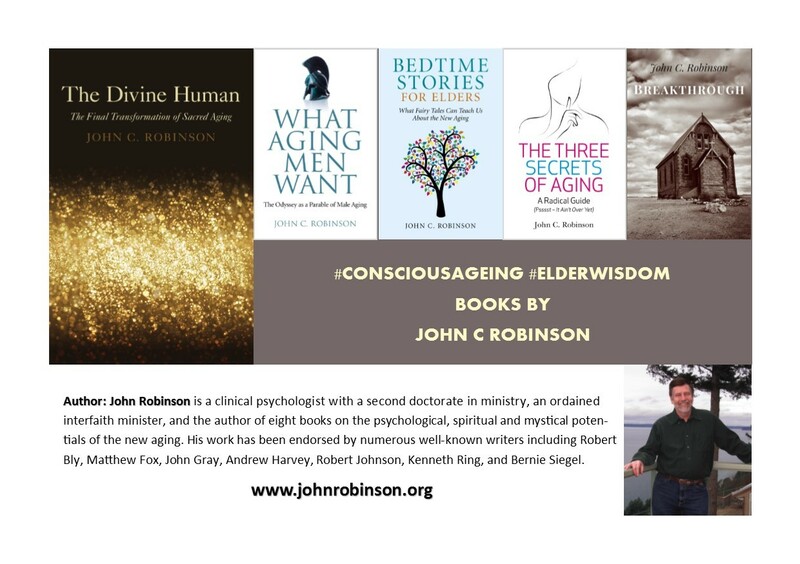 Rabbi Schacter-Shalomi tells us that "Elderhood represents the crowning achievement of life" and Jean Houston adds, "The years beyond 60, the years of our second maturity, may be evolution's greatest gift to humanity." Carl Jung, the great psychoanalyst, claimed that old age would not exist unless it had an evolutionary purpose. So this is what we want to understand - how can aging be the crowning achievement of life, the greatest gift to humanity, and a purposeful stage of human evolution? Part of the answer to this question comes from the conscious aging movement which has made enormous contributions to understanding the psychological and spiritual tasks - and gifts! - of aging. One relatively undeveloped area, however, has been the mystical experience of aging, an area that has become central to my own life and work. What might the mystical experience of aging involve? Aging represents a natural transformation of self and consciousness. The events and process of aging - changing bodies, fading identities, and losses of all shapes and sizes - steadily dissolve all the social constructs that previously defined us. One day, looking at our latest photograph, we no longer recognize our self. Whether we like it or not, we end up surrendering virtually everything we were. While we can hang onto past identities and achievements, these memories grow stale for they no longer represent who we really are. But this procession of losses, as the mystics tell us, constitutes the quintessential pre-requisite for enlightenment. What's left when the ego's filters of identity, time and story dissolve is consciousness itself, which the mystics also tell us is the consciousness of the divine. We are victims of mistaken identity. We replaced the divine Self, our truest self, with the self-idea and came to believe that consciousness was simply an epiphenomenon of the brain. But a new kind of aging has begun. Our remarkable new longevity and growing interest in conscious aging have created a new developmental stage in the human life cycle. We're living decades longer! With this gift of time, we have the opportunity to tune into the previously overlooked mystical dimensions of age. As Mystical Consciousness erases the dualistic filters of thought, we discover that consciousness is not just in us, we are in it and it is the omnipresent consciousness of God. We live in a sea of consciousness! Then, if we are willing to descend into the unfathomable depths of inner space, we open yet another deeper experience of the divine Self, an infinite consciousness that begins to rise as a tidal force of love suffusing and transforming the structures of ego and personality. Like the metaphor of "one river, many wells," we each have a channel directly into the aquifer of Spirit, and it changes us. We begin to experience the radical new possibilities of the Divine Human. Religions have long prophesized the coming or return of a divine savior - I believe that savior is us. As I dwell in this sea of divine consciousness, I change. No longer wanting or needing a persona, I discover that I am consciousness itself. Ecstasy then erupts as I merge consciousness with physical being, and the divine Presence floods my psyche. I dissolve in that Presence and discover that its love is infinite, extends everywhere, and touches everyone, so that when I love, I touch the whole universe. In this process, a new kind of life emerges, a divine life, and the world changes before my eyes. These mystical realizations transcend religion and spirituality, transform self and consciousness, and bring new gifts to a world sorely in need of love. They can transform our aging if we are informed, perceptive and willing. We’ve got aging all wrong and the culture’s grim beliefs are “scaring us to death.” Even our inevitable physical decline may represent a dissolution into an incredible new consciousness. But to experience this new consciousness, we need to learn what this New Aging really is. Please join me. Explore the books available on this site. Test out their arguments. Each book holds a piece of the puzzle for you - put them together and build your next life. Discover a life stage you never thought possible, never even conceived. And then let's change the world, not from the old model of heroic combat, but from the new consciousness that is the new aging. "Introduction to Mysticism and The Mysticism of Aging"
Creation Spirituality Communities "Elder Interviews"
"Initiation, Transformation and Revelation: The Mysticism of Aging"
Stillpoint at Beckside "What Do Aging Men Want"
Stillpoint at Beckside "Enlightened Aging"
Creation Spirituality Communities "Elder Interview with Matthew Fox"
St. John's Communities: "Psychological and Spiritual Tasks of Aging Men." Luminary at Sunnyside: "The Three Secrets of Aging." Sermon and Workshop: “Where Do I Fit? The Discovery of Personal Wisdom and A Place in the Universe.” Center for Spiritual Living, Tacoma, WA, 7/15/07. Retreat: “Sacred Sight.” Mercy Center Auburn, Auburn CA. 7/27-29, 2007 with Fr. Joseph Mitchell. "A Men's Gathering on Aging." 3/12/11. Lions Gate Hotel, Sacramento, CA. Five Session Lenten Class on "The Magic of Aging" at United Church of Christ, Fox Island, WA. 2/17-3/24/13. 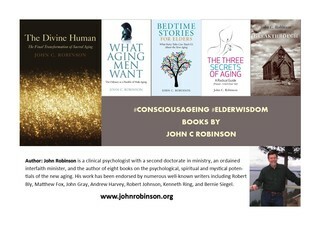 "The Magic of Aging," CSourceWisdom National Webinar, 8/2-30/13. "The Three Secrets of Aging" and "What Aging Men Want" workshops at "Gifting the World as We Age" conference, Sag-ing International 2014 Conference, Seattle University, 8/21-24, 2014. "Initiation, Transformation and Revelation: The Magic of Aging." 6th International Conference on Aging and Spirituality, The California Endowment, Los Angeles, CA., 10/4-7, 2015. Keynote Talk and Workshop: "The Transformation of Self and Consciousness in the New Aging." My Spirit Flies, Louisville MKP Elders Circle, 11/13-14, 2015. "Lent and the Mystical Jesus." Fox Island United Church of Christ. Fox Island, WA. 2/14, 21, 28, 3/6/16. "Conscious Aging" (Three Lectures). Creation Spirituality Communities 2016 Gathering: Honoring the Elders, Nurturing the Future. Berkeley, CA, 7/28, 7/29, 7/30/16. "Finding Your Calling: Giving Back to the World." Conscious Elders Network National Gathering 2016, One Earth, One Humanity, One Future! Mercy Center, Burlingame, CA, 9/19/16. "What Will I Give Back? Discerning My Gifts and Alternatives in Caring For the World." Sag-ing International 2016 Conference: Wisdom and Spirit in Action. Loveland, CO 10/20-23. "What Will I Give Back? Discerning My Elder Gifts and Possibilities." The Shift Network Transforming Aging Tele-Summit, March 7-9, 2017. "The Divine Human: The Final Transformation of Sacred Aging." 7th International Conference on Ageing and Spirituality. Concordia University Cnicago, 7/4-7. "The Divine Human: The Final Transformation of Sacred Aging." Sage-ing International Webinar, 10/3/17. "Elder InnerViews." Creation Spirituality Communities Ongoing Series. Interviews with Jeremy Taylor, 5/18/17; Gina Rose Halpern, 9/19/17; Alexandra Kovats, 10/19/17. "What Will I Give Back? How to Discover What Your Soul Still Longs to Do." 3rd Act Magazine, Fall, 2017. Robinson, John. The Divine Human. Watkins Mind, Body, Spirit Magazine. Winter 2017, Vol. 52, pp. 52-52.